Maslenitsa is one of the greatest Russians festivals and, perhaps, the only that’s not directly connected to the Russian Orthodox Church. Not that it’s being widely celebrated as, for example, the New Year’s arrival, but with very cheer street performances and entertainments. The Maslenitsa 2017 dates are February 20 — 26. Dating back to the pagan times, Maslenitsa is an old Russian tradition, a local version of mardi gras. The name of Maslenitsa derives from the Russian word «масло» (butter). The festival also known as The Butter Week is celebrated for a week where each day has its own function. The festival marks the winter’s leaving and the arrival of the spring and the Great Lent (the Great Fast). 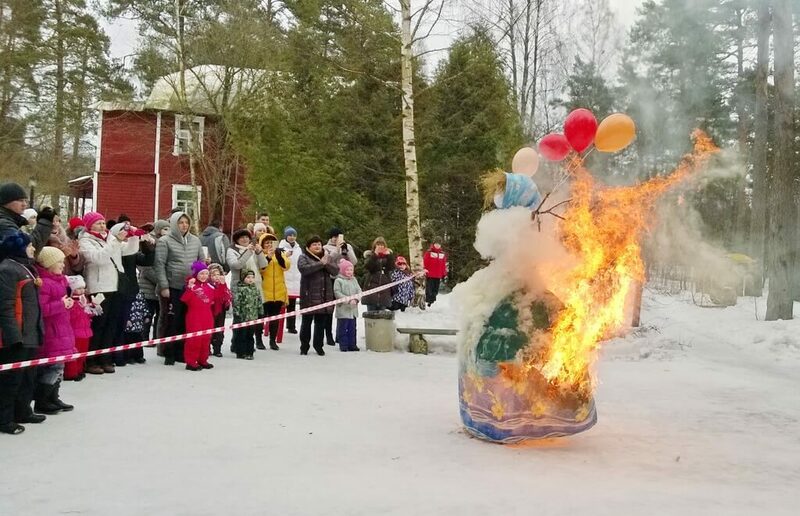 The culmination of all the entertainments that traditionally include a wide variety of people’s games and other funny things is the burning down of an effigy symbolizing the winter. 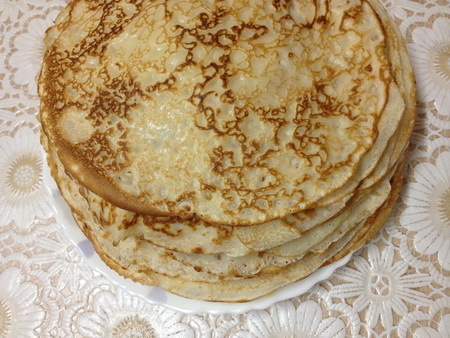 Throughout the week, a lot of eateries are offering Maslenitsa-style menus with a focus on pancakes (blini) (on picture), the main dish of the festival. Much of celebration falls onto the weekend, February 25 and 26. In St. Petersburg, every district organizes its own celebration which usually takes place at parks. A traditional set of entertainments includes a storm of an ice fortress, fist fighting, sack fighting, zero-sum game, walking on stilts, dancing etc. 2. Peterhof holds its own Maslenitsa party at the Dvortsovaya square with all the entertainments and master classes in different Russian crafts from 13.00. (NOTE: It’s the Dvortsovaya square in Peterhof, not in St. Petersburg!) February 18 — 25. 3. The longest Maslenitsa festival will take place at the Pionerskaya square in the city center from 12.00 to 20.00 (NOTE: not Pionerskaya subway station, it’s in another part of St. Petersburg). Traditionally, a fair works here. February 25. All the events feature musical and dancing performances, pancakes, hot tea and, of course, the burning of the winter’s effigy.